Most everyone has a tequila story, and most all of them come with a less than pretty ending. I mean, it makes sense... Tequila? Dangerous stuff. Yet the time of high school indiscretions might best be left behind as a new dawn rises. You have grown up and so has the tequila. (The latter probably has been an adult it was first introduced, but never mind...) And Borracho? It's not a bad spot at all. In fact, other than a definite bro factor, it has a lot going for it. Let's get that bro part out of the way first. This being the former location of Ugly Betties, it should come as little surprise that the bros are still hanging around, though luckily they seem out of place. During our after-work visit, the other half of the visitors were, well, normal people enjoying tacos and tequila in a nice relaxed setting. Relaxed, other than the... Well, you know. Hopefully the soon to open daiquiri place will lure the bros away. That and previous tequila experiences aside, I quite enjoyed the infused tequila I tried. Salsa flavored? It actually lived up to its name, giving it a Bloody Mary-esque profile. I'm not sure if that's everyone's “thing” or not, but it worked quite well for me. 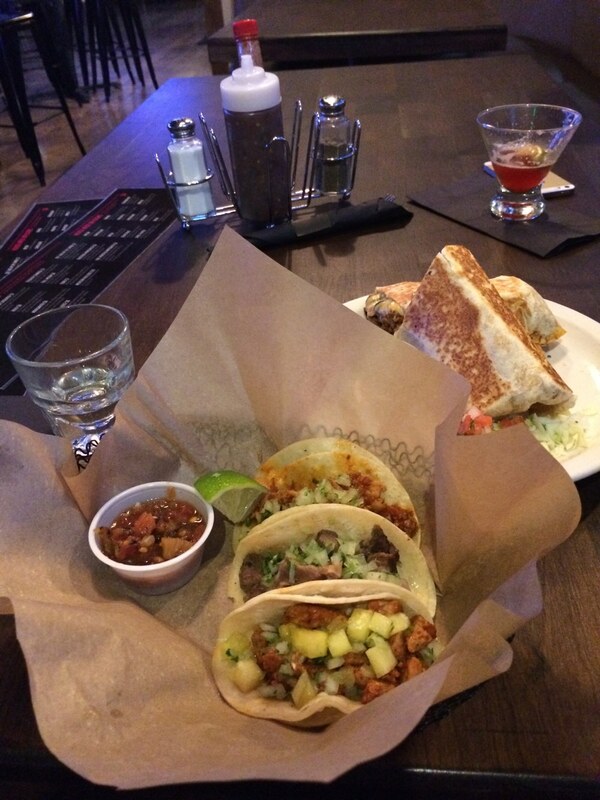 Mr Spokane has talked up Borracho's lengua tacos, and we can see why. The meat was perfectly tender -- kind of the litmus test for a good lengua -- with a spicy flavor kick. Add your standard toppings on a flavorful tortilla, and we had what added up to be a very good taco. And that's all we want. Sadly the al pastor didn't work quite as well: the meat was too dry and lacking in flavor. The tinga fared better, even though it wasn't quite up to the standard of the lengua. It had some flavor to it, but was perhaps a bit too chewy. One could argue the small tacos are a little bit too small for $2 a pop, and one might be right. Personally, though, I found them well-stashed with meat and toppings, enough so to be worth the price. In a sense the burrito might be a better deal if you're looking for size-for-your-bucks. Again you can choose your type of meat -- the chorizo y papas had a great kick to it -- stuffed into a decent sized tortilla. Actually, worth pointing out are the papas: the tiny cubes of potatoes were really good, taking on the spices perfectly. And that's probably a good way to sum up Borracho: It's quite a good place. We like it, and we'll be back. Hopefully the bro factor will be turned down a notch then, but it's hard to argue with the infused tequilas and tacos. Borracho was a surprise experience, and we mean that in a good way. You should probably check them out. Do you recommend Borracho Tacos & Tequileria? Make your voice heard!